Woodstock was originally named ‘Papendorp’. From a country estate in the middle of the 18th century it gradually developed into a line of houses along a dusty main road. The name was changed from ‘Papendorp’ with its associations with fishing and ‘wreckers’, to NEW BRIGHTON and finally to its present name, WOODSTOCK. The new railway line was advertised in 1859 to pass through the area. This was to be the first railway line in South Africa. Speculators took full advantage of this development and Woodstock began to grow rapidly. 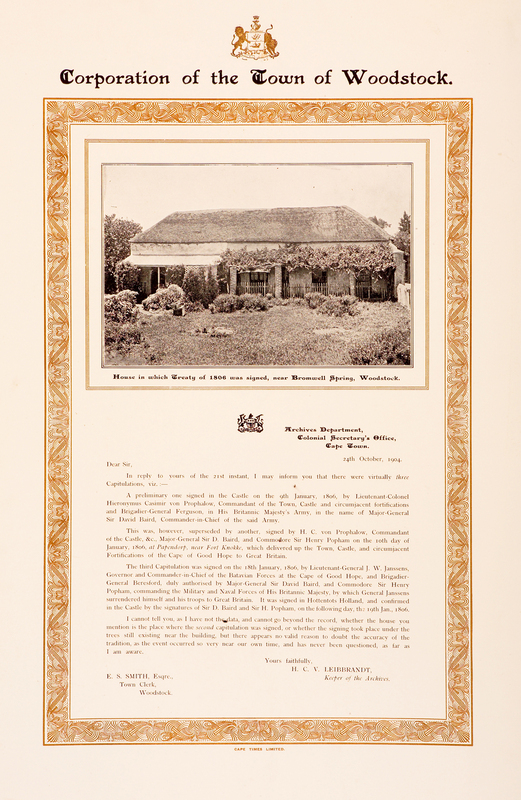 In 1881 the Hamlets of Papendorp, Altona, Roodebloem, Woodstock, Leliebloem, Salt River and the surrounding houses were formed into a municipality. It was incorporated under Act 45 of 1882 as the Municipality of Woodstock in August 1883. During this period it became almost solely a sea-side bathing resort, but continued to become more industrialized and urbanized. In 1884 it was the third largest town in the colony and completely self-supporting. By 1952, the old Woodstock beach had been incorporated into the Foreshore scheme. To commemorate the site where the peace treaty between the British and the Dutch was signed in 1806, the Commission for the Preservation of Natural and Historical Monuments, Relics and Antiques declared Treaty Tree in Treaty Street a national monument.